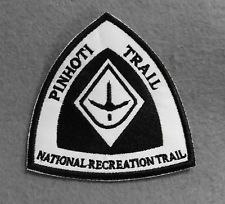 Pinhoti National Recreation Trail is a premier southern Appalachian long distance hiking trail. The total distance of the trail is 334.9 miles. There are 171.2 miles in Alabama and 163.7 miles in Georgia, which makes the Pinhoti the longest hiking trail in either state. Their distinctive trail symbol is a turkey foot. 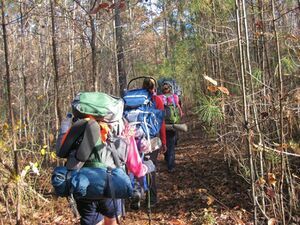 Actual development of the Alabama Pinhoti Trail got started in 1970 and seven years later, a key portion through the Talladega Forest was designated a National Recreation Trail. Since then more segments have been added courtesy of the Alabama Wilderness Coalition, US Forest Service and Alabama's Forever Wildland Trust. Even though the full trail was ceremoniously completed in 2008, there is still much needed to improve the trail. Hiking shorter portions of the trail is a great test for beginner hikers and backpackers. Allow 3 weeks to hike the entire trail. Best time of year to experience Pinhoti is springtime. The trail's southern terminus is on Flagg Mountain (the southern most Appalachian peak that rises over 1,000 feet) which is located near Weogufka, Alabama. The trail's northern terminus is where it joins the Benton MacKaye Trail / Appalachian Trail. The Pinhoti Trail is a part of the Eastern Continental Trail and the Great Eastern Trail, both very long-distance US hiking trails connecting multiple states. Most of the Georgia Pinhoti Trail is in the Chattahoochee National Forest. Cheaha State Park in Alabama is a 2719 mountain-top wilderness preserve. Facilities include a 30-unit resort inn, restaurant, vacation cottages, chalets, modern campground, picnic areas, biking trails, hiking trails and lots of beautiful scenery. Chief Ladiga Trail - The Pinhoti joins the Chief Ladiga Trail, a 33 mile long rail trail, for a short portion. The 33-mile trail stretches from the Alabama-Georgia state line to Weaver. The Chief Ladiga is on the same rail corridor as the Silver Comet Trail in Georgia as far as Piedmont, Alabama. From there it parallels an abandoned Southern Railway line for a few miles west of town until it leaves the old Seaboard rail line, heading south on the Southern Railway route until the trail ends just north of Anniston. As of August, 2007, pavement is continuous between the Ladiga and Comet trails. A new gateway marks the connecting point at the state line. Now that the Chief Ladiga and the Silver Comet trails are connected, there is a 90-mile (145 km) paved corridor for non-motorized travel from just west of Atlanta, Georgia to Anniston, making it the 2nd longest paved trail in the U.S. Chief Ladiga was a Muscogee chief who relinquished his tribe's lands when he signed the Treaty of Cusseta in 1832. Dugger Mountain, the second highest peak in Alabama with an elevation of 2,140 feet, is located between Anniston and Piedmont. The wilderness encompasses some of the most rugged and mountainous terrain in Alabama, as well as numerous endangered and threatened plant communities. It is one of the last intact roadless areas in Alabama's National Forests. Most of the mountain's 16,000 acres is too steep to profitably cut for timber harvest. This page was last edited on 7 January 2018, at 17:06.